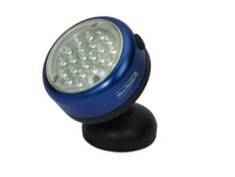 This light has a sturdy aluminum housing and 24 LEDs to provide bright illumination. Powerful magnetic base provides securement to any steel surface. The head rotates to allow directional positioning. Runs on 3 AAA batteries (included).